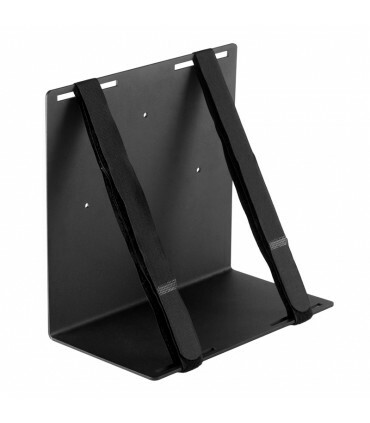 The Universal PC Mount 600 is designed to support and hold large desktop computer towers, heavy battery backup units, and other big office hardware. 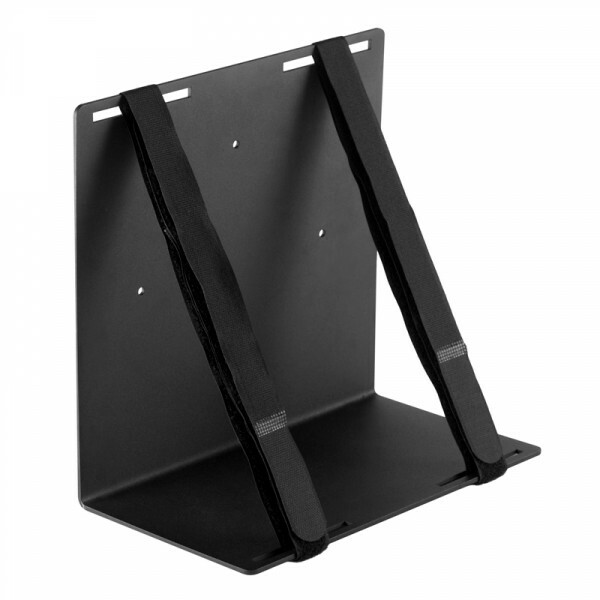 This adjustable computer wall mount is made of sturdy, heavy gauge steel so that your device is secure and protected when mounted on the wall, desk, or other stable surface. Also, because this mount is versatile, easy to use, and simple, it's able to be used for many different mounting applications which guarantees use in the future for mounting other devices. All Universal Mounts from Oeveo are great investments because they last, are adaptable, and can be used for an endless amount of applications. To learn more about the Universal PC Mount 600 and all of it's Features and Specifications, check out the other tabs. Also, if you have any questions regarding this mounting solution, please feel free to call, chat, or email us about your inquiry. We are always happy to provide support. 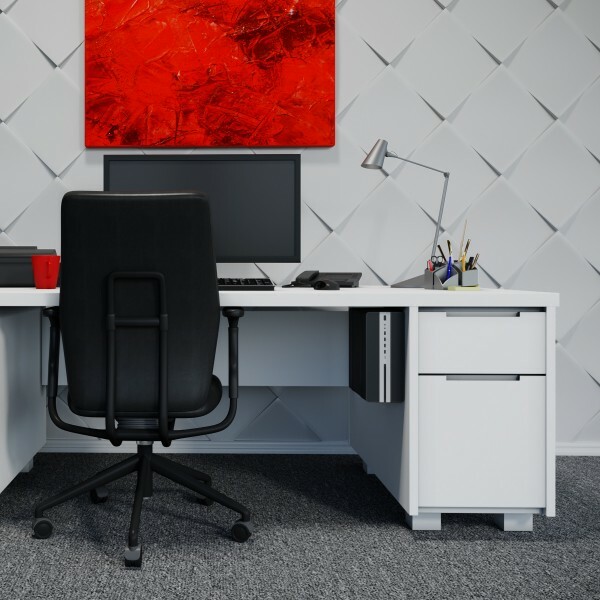 All-purpose and Adjustable mount design is able to support a variety of Desktop Computer Towers, PC Towers, UPS units, Battery Backup units, and other large office electronics. Minimalist mount design goes relatively unseen when your device is mounted. Easy Setup can be done in minutes. All mounting hardware is included with your package. 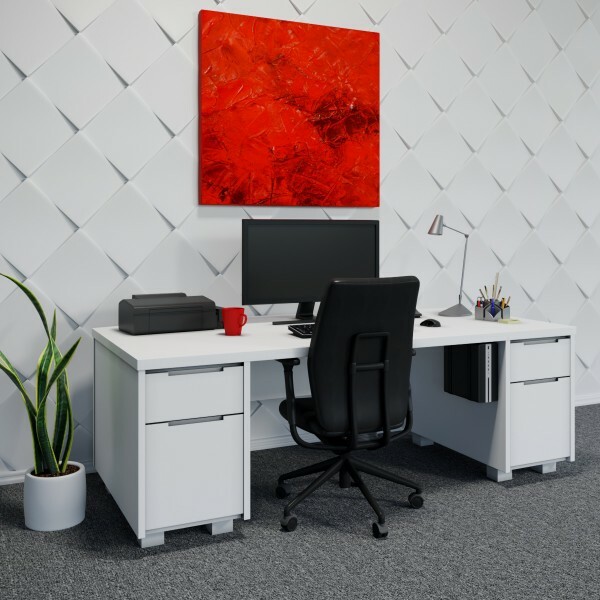 Organizes and Saves space around your workplace for your to get the important jobs done. 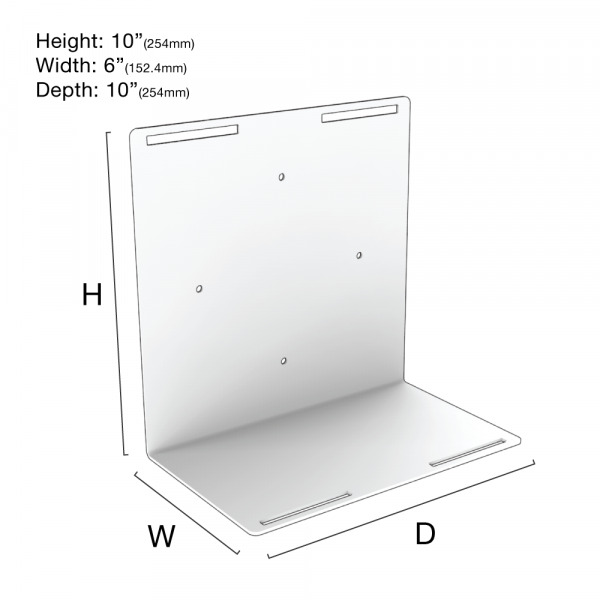 Mounting Options: Directly to a wall, to the side of a desk, table, or other stable surface. Mounting Dimension Abilities: Capable of mounting devices with a circumference up to 45" (1143mm). Best used with devices that have a width of 6" or more (152.4mm or more). 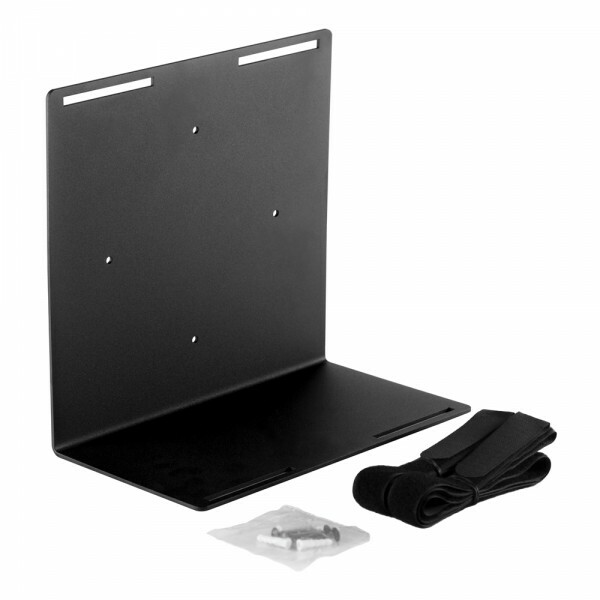 Best Uses: Our customers use the Universal PC Mount 600 as means of Wall Mounting Computer Towers, Large PCs, Big Battery Backup Units, and other hefty, heavy electronic hardware. The Universal Mount is the most capable and sturdy mount there is to Wall Mount your device. Note: Other devices are compatible with this mounting solution. If your device is not listed below and you would like to know if it is compatible, please chat us for quick support.  Acer Computer Models: Aspire TC - ATC-710-UR57, ATC-710-UR55, ATC-780-UR61, ATC-780-AMZi5, ATC-280-UR11, ATC-780A-UR11, ATC-705-UR62; Aspire T3 - AT3-710-UR61; Veriton M - VM4640G-I7670Z, VM4640G-I5650Z, VM4640G-I5640Z, VM4640G-I3610Z, VM6640G-70021, VM4640G-I5650Z, VM4640G-I5640Z, VM4640G-I3610Z, VM6640G-70021, VM6640G-70020. Dell Computer Models: OptiPlex Tower - 3040, 3046, 3050, 5040, 5050, 7040, 7050; OptiPlex Mini Tower - 390, 580, 790, 990, 3010, 3020, 7010, 7020, 9010, 9020; Precision Tower - 3420, 3620, 5000 Series, 7000 Series; Inspiron Desktop; XPS Tower. HP Computer Models: EliteDesk 705 G2 Microtower PC, EliteDesk 705 G3 Microtower PC, 280 G2 Microtower PC, ProDesk 600 G2 Microtower PC, ProDesk 400 G3 Microtower PC, Pavilion Desktop 510 Series, Pavilion Desktop 560 Series, ENVY Desktop 750 Series, OMEN Desktop PC 870 Series, EliteDesk 800 G2 Tower PC, Z240 Tower Workstation, EliteDesk 800 G1 Tower PC, Z440 Workstation, Z640 Workstation, Z840 Workstation. Lenovo Computer Models: ThinkCentre M700 Tower, ThinkCentre M800 Tower, ThinkCentre M700 Tower, ThinkCentre M900 Mini Tower, IdeaCentre 300-20ISH Mini Tower, IdeaCentre 200 / S200 Tower. IdeaCentre 700. For more information about the Universal PC Mount 600, please call, chat, or email us about your inquiry. It is perfect for a UPS!